Popular cakes: butter cake with raspberry buttercream and framboise syrup. Her favorite: Opera torte – a thin almond cake with Kahlua syrup, chocolate Ganache, and espresso buttercream. Memorable wedding cake moment: “My first official cake. … That whole wedding – I was working in a new kitchen, I basically had to prepare everything within 24 hours of the wedding = a cake for 450, plus seven additional desserts per person, as part of a dessert buffet, with 12 to 13 different kinds of desserts. That was truly a challenge." At the age of 54, Ursula Argyropoulos changed careers from cooking school instructor to wedding cake artist. “I literally said, for my entire life, ‘I don’t know what I am going to do when I grow up.’ But now I am doing what I want to do when I grow up.” Argyropoulos was born in Germany and came to the Philadelphia area when she was 10, in 1952. She grew up working in her uncle’s bakery. She then trained as a secretary, married, had children, and went back to working as a secretary when she got divorced. A friend insisted that she do something with food; an opportunity to teach baking at Newbury College brought Argyropoulos to Massachusetts. The job turned into a full-time position, which she held for 13 years. “Their program was for years designed around traditional culinary training – focusing in on European pastries and very little cake decorating. But over the years we had more and more students wanting cake decorating,” Argyropoulos says. So cake decorating began to be incorporated into the course, and Argyropoulos learned from books and taught what she learned. 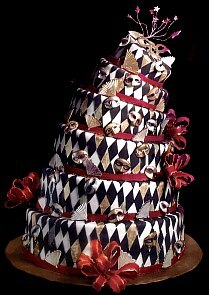 Argyropoulos spent the summer of 1997 working for New York City cake master Colette Peters. “As I was working,” she says, “I realized this is what I really want to do. My game plan at that point was I would take a wedding here, a wedding there, and start developing something outside my teaching career.” She began to look for a professional kitchen. When she returned to Boston, opportunity knocked. The New England Financial building had a fully equipped kitchen for its cafeteria, and no one used it after 4 in the afternoon. She was offered a deal that included use of the kitchen, office space, and windows to display her cakes. She quit her job in August 1997 and filled her first order. “Basically, I was in business before I knew it,” she says with a laugh.